As the granddaughter of our founder, Joe Seals, Cathy was exposed to O&P work at an early age. 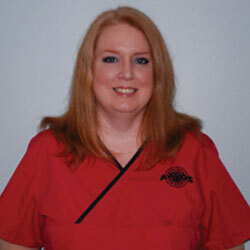 After graduating from Southern Technical College in 1990, she began her career at AALOS. Now, as Prosthetic Billing Manager, Cathy deals with authorizations and claims billing. Her loyalty to the company is her driving force. Cathy enjoys spending time with her niece and nephew, as well as friends. She also enjoys listening to 80’s music, shopping on QVC, and going to movies. Cathy attends Landmark Church of Christ where she helps with children’s church and Sunday school.